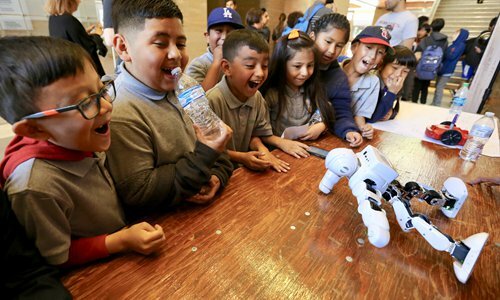 Elementary school students watch a robot do push-ups at the annual USC Robotics Open House in Los Angeles on Sunday. The event has been held annually since 2010 and attracts between 1,000 to 2,000 visitors from the area, focusing on K-12 students and families. Chinese company BYD announced this week bus number 300, as it rolled off production lines at the Lancaster manufacturing facility in Southern California. The milestone was celebrated with the company's client and neighbor, Antelope Valley Transit Authority (AVTA). A special ceremony was held at San Diego Zoo Saturday, April 6, kicking off a three-week-long farewell celebration for 27-year-old female giant panda Bai Yun and her 6-year-old son Xiao Liwu, who will be repatriated to China this spring in line with the Zoo's conservation loan agreement with the People's Republic of China. Two children play with a robot during the Clippers SciFest SoCal science fair at the Los Angeles Convention Center on Saturday. The fair, a science showcase aimed at inspiring students to pursue careers in science, technology, engineering and mathematics (STEM), was held on March 22-23 at the Los Angeles Convention Center. People pray at the Islamic Center of Southern California in Los Angeles on March 15, after attacks on mosques in New Zealand on the same day. At least 50 people were killed in mass shootings at two mosques in the New Zealand city of Christchurch. Paleontologist Ashley Leger shows the skull of a young Columbian mammoth found at the construction site of the Metro Purple Line extension in Los Angeles on March 4. The fossilized remains of creatures that roamed southern California 10,000 years ago were discovered by a crew digging for a subway extension. The picture taken on February 26 shows the hillsides in Lake Elsinore, Riverside County, are covered in a blaze of golden-orange poppies. The heavy rain of this winter may have made the last few weeks a bit gloomy, but the aftermath of all the precipitation is a super bloom of poppies in the Inland Empire, Southern California. Would-be firefighters participate in an exercise during the Los Angeles County Fire Department's fourth Annual Women's Fire Prep Academy opening day on Saturday at the Cecil R. Gehr Memorial Combat Training Center. The opening day featured an intense competition involving almost 300 female participants. Few could survive the intense training to qualify for the firefighting program over five consecutive weekends of training. In October 2018, after police raided a local massage parlor in Flushing, a Chinese woman who worked there was found dead minutes later ­after she jumped from the building's fourth floor. Her name was Song Yong. Rather than face arrest and possible deportation, she chose another way out. Runners take part in the Chinatown Firecracker Run 2019 in Los Angeles on Sunday. About 9,000 runners came in from all over town to participate in the run, and the organizers were going whole hog with the celebrations of the Pig of the Year. California Governor Gavin Newsom said on Tuesday the state will dramatically scale back a planned $77.3 billion high-speed rail project that has faced cost hikes, delays and management concerns, but will finish a smaller section of the line. The Southern California alumni association of a prestigious Chinese university celebrated the Chinese lunar new year at Holiday Inn Hotel in El Monte on February 9. Attended by nearly 100 alumni, the event featured traditional Chinese food, performance and a raffle, aiming to boost its alumni network and cater to the diverse needs of its members. The 120th Golden Dragon Parade kicked off Saturday in Chinatown of western US city of Los Angeles, providing a festive outdoor atmosphere to celebrate the Chinese New Year. When it comes to extreme endurance challenges, names like Lizzy Hawker, current world record holder for running from Everest Base Camp to Kathmandu, and Dean Karnazes, an American who ran continuously for 350 miles, are popular examples of what humans can achieve. 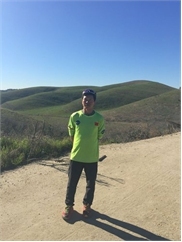 In comparison, Chinese names are rarely mentioned when such endurance challenges are discussed, but that will soon change as a Chinese runner is on his way to complete the unthinkable. The six-day Los Angeles teachers's trike that left 600,000 students in limbo ended on the night of January 23 after a new agreement reached hours earlier which enables teachers to return to work a day after. The strike has revealed the failure of the American public school system. Floral floats and marching bands took to the streets under a sunny California sky as the 130th Rose Parade drew hundreds of thousands of spectators on New Year's Day and millions more watched on TV. It might seem odd to think, but there was a time when being sexist, bigoted and racist was not only normal - but something that was accepted by the public. What's even more shocking is that these behaviors were commonplace within the last 20 years. What is the meaning of this new US strategy? 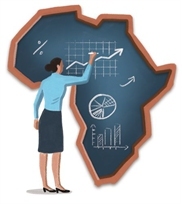 Where are China-Africa relations headed?